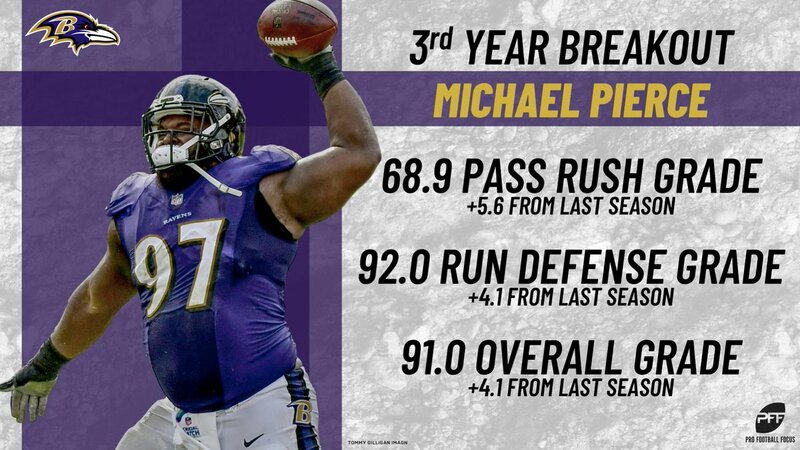 At the midpoint of the third quarter in the Baltimore Ravens’ 2016 season opener against the Buffalo Bills, interior defensive lineman Michael Pierce made his first contribution to an NFL stat sheet. The former undrafted free agent lined up at nose tackle and patiently waited for quarterback Tyrod Taylor to make a decision on the read-option play. When Taylor gave the rock to running back LeSean McCoy, Pierce made his move. The 340-pounder pushed forward before pouncing on the six-time Pro Bowler, limiting him to no gain — it was the first defensive stop of Pierce’s career. That stop would be the first of 25 that he went on to record in his rookie campaign, and it was the first of the 83 that he now has next to his name after three years in the league. Over those three seasons, Pierce has continued to blossom into a threat from the interior, and he has made his mark against the league’s best blockers. Prior to 2016, Pierce’s chances to ever step on an NFL field — let alone in Week 1 as a key component of a defensive line — were slim to none. The undrafted free agent had a solid pro day but was severely underrated coming out of Samford. But as fate often has it, talented players stick out regardless of their origins. And Pierce has stuck out quite a bit, grading out as the fifth-best interior defender in 2018 (91.0), and the fourth-best against the run (92.0 run-defense grade). Pierce’s progression from Southern Conference standout to upper-echelon interior defender in the NFL is atypical — but representative of a player who has put in the time to master his craft. Since his NFL debut, Pierce has led the Ravens in run-stop percentage each year, and his 12.0 percent mark in 2018 ranked second among interior defenders, only behind perennial leader Damon Harrison. Pierce’s overall grade and his run-defense grade have both improved each year, and they reached elite status in just his third season. In 2016, Pierce made the first contact on run plays just 21 times from an interior position, ranking 47th among interior defenders. In 2017, his potential truly shined. He notched 41 first contacts on run plays from the interior, sixth-best at his position. He saw his fewest run-defense snaps yet in 2018, leading to 25 first contacts (35th), but Pierce’s production rate on running plays is objectively one of the best in the NFL. An elite overall grade doesn’t necessarily mean a player is dominant in every phase of the game, though. Pierce’s unrealized potential lies in his pass-rushing game, where he was unable to notch a sack in 2018 and has generally been quiet in his three years. His 68.9 pass-rushing grade in 2018 was a new career-high, but it ranked merely 26th among interior defenders. That’s a perfectly fine place to be among 110 qualifying players; however, there’s a reason to believe that Pierce is still far from his best. Look no further than perhaps the best player in the NFL: Aaron Donald. The former first-round pick is admittedly an outlier, light-years ahead of anyone at his position. In his rookie campaign in 2014, he too made his mark against the run with a 90.8 grade while notching a less-impressive 77.8 grade as a pass rusher. Granted, Donald has graded out at 85.0-plus in both categories each year since and racked up nearly 70 more pressures in 2018 than he did in 2014. But Pierce has the opportunity to follow a similar — albeit slower — trajectory. Donald has improved his pressure total each year in the league, and so has Pierce. While Pierce’s is on a much (much) smaller scale, it shows an ability to develop — an ability to persevere just as he did after going undrafted. Pierce doesn’t need to be the all-around prototype that Donald is, and he won’t be. But his numbers suggest he could follow in the star’s footsteps and make a significant leap in the pass-rush game while maintaining stalwart status against the run. Making the NFL as an undrafted free agent is impressive enough. Pitting yourself as a top-five player at your position at the same time puts you in rare company — and Pierce appears to be just getting started after three stellar seasons.